We all have our reasons for collecting vintage toys. What I find intriguing is that collecting as a hobby is a multifaceted phenomenon. For some it’s that almost primal urge to complete a set of something, for others it might be the thrill of the hunt. For some it’s to get a kick out of owning something that is very rare and keeping it locked away from prying eyes, for others it’s the kick of sharing those rare items for other collectors to see. For most of us it will be a combination of some of those, but what most of us will have in common is that one reason I haven’t mentioned yet… and that’s nostalgia! I’m a nostalgic sucker, hands down. 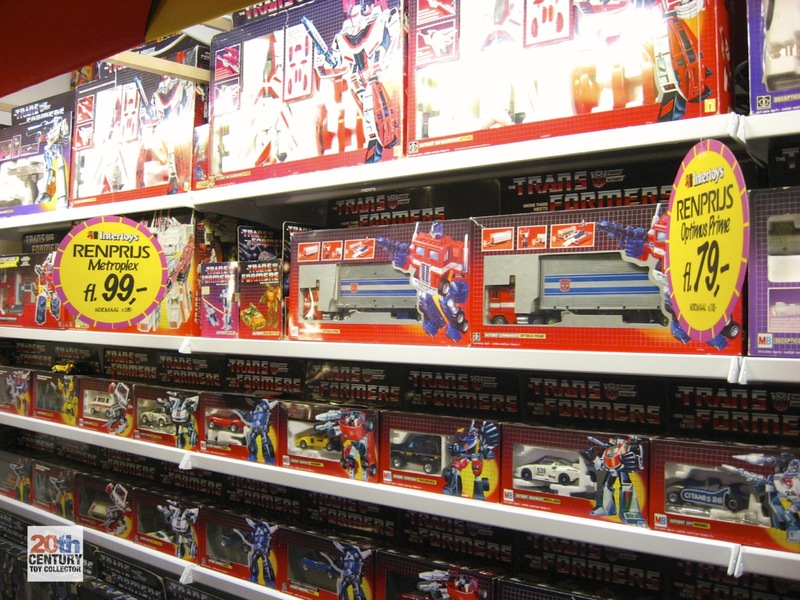 Simply the act of looking at those toys inside their beautifully designed 1980′s packaging is enough to put a smile on my face no matter what. It never fails to evoke that wave of warm and fuzzy feelings in my brain. Love it, love it, love it. Being one of the most densely populated countries in the world, real estate prices in the Netherlands are crazy. Especially in the Utrecht area, which is where my girlfriend and I moved in 2009. We didn’t really have much choice to move elsewhere, because I’m an independent contractor and find myself working all over the Netherlands. Utrecht is pretty much dead in the middle of the Netherlands, so it was the best option to keep the time I spend travelling to and from work to a minimum. It’s not a big country, but the highway traffic jams are murder. Finding an affordable house and then finding enough room to house a sizeable collection of vintage toys within it is not easy. I realize I’ve been blessed with the fact that our house is big enough for me to have one whole, relatively large room dedicated completely to my insane hobby. When we moved in here I decided to arrange the room to resemble the inside of a toy store as much as possible. I actually went out and bought real store display shelves from a wholesale dealer that I found. The dealer asked me what sort of store I owned. Imagine his surprise when he learned that I would use it to display a collection of 25 year old toys… LOL! I’ve got 3 meters of store shelves lining two walls opposite of one another. Then in the middle of the room is a 2 meter wide gondola display, so I have 2 aisles in my room with toys on both sides! 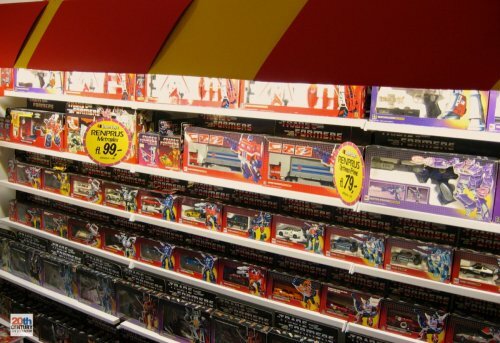 In the photo above the second aisle is in the back and shows part of the Transformers shelves lining one wall in one of the 3 meter wide displays. At the end of the aisle is a small desk with a vintage Commodore Amiga on it, where I sometimes do some retro gaming (and even write some articles for my blog, LOL). In front you can see part of the gondola display that divides the room in two and part of the first aisle. Not visible on this photo, and opposite this gondola display is another 3 meter wide display, just like the Transformers wall, that primarily holds my G.I. Joe collection and assorted other vintage toy lines I collect. Since I bought these store displays I’ve expanded them with more shelves so that I could fit more toys and have most of my Transformers visible. 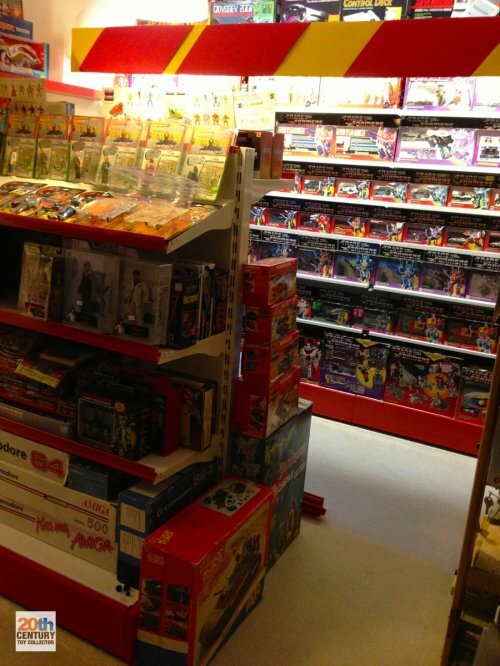 Not too long ago I embarked on an unholy mission to change the interior to resemble the decoration of my favourite toy store when I was growing up, which is the Intertoys chain of stores. I designed and built the big yellow header with red stripes that you can see at the top of the Transformers wall. I also faithfully recreated and added some price hangers, which you can see in the photo below. 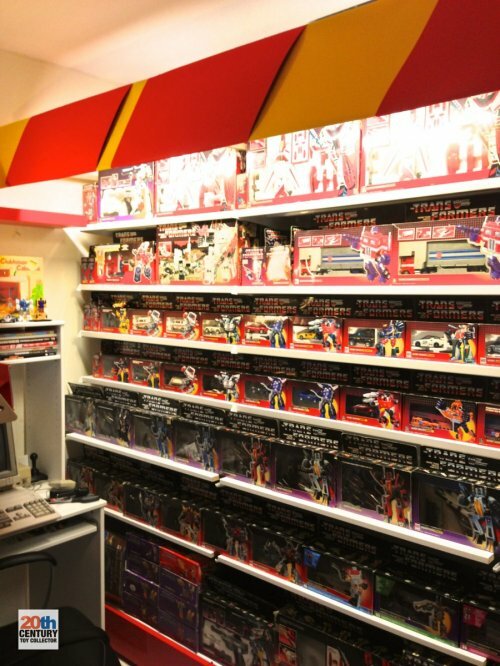 I hope you enjoyed this little peak into my collection room, even though it’s “just” the Transformers side of the room. I might feature the whole room in a future article one day, but that will probably have to wait until we’ve moved into our new house. Wow! This is one of the most incredible things I’ve seen. Your collection and display are truly amazing. Thanks for sharing it with the rest of us! This Toy Store set-up is brilliant! More photos! When can I come over and open some of your doubles? Prachtig,het is en blijft een mooie en bijzondere verzameling. Hope to see you sometime again. I’m speechless…. thanks for the photos and article. Thanks for all the very kind comments! This is class, pure class! Thanks for sharing these pictures, I hope one day to do the same with my stuff. My sincere and warmest congratulations!!! 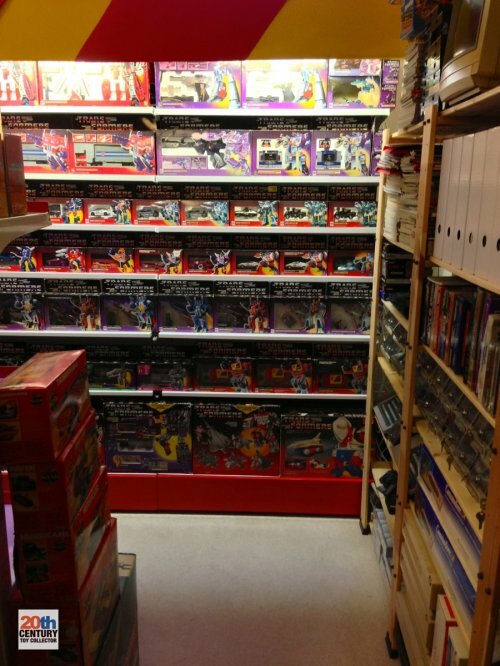 It’s like stepping into a toyshop from my childhood. Very cool. sheer heart attack! Bravo my friend, excellent collection. Every big boy’s dream! Bravo! It’s like time traveling back to the 80′s. 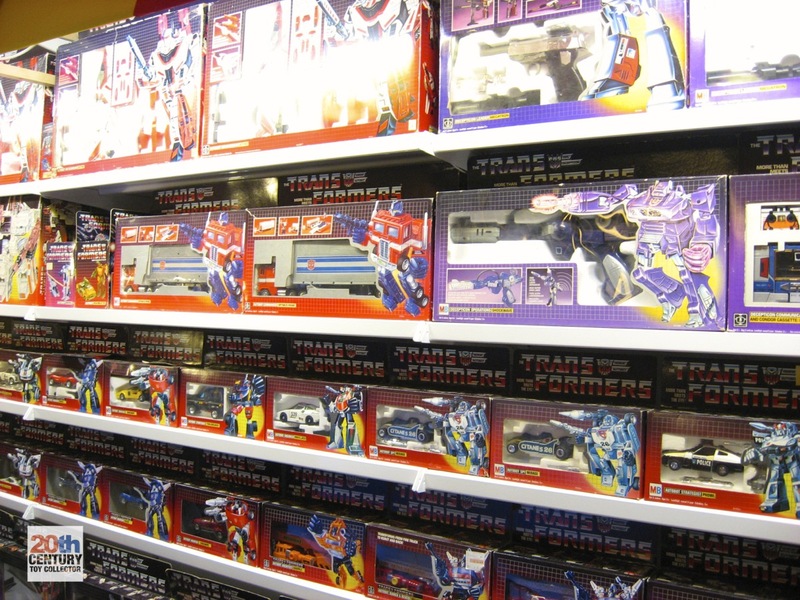 This is the best display of Transformers (and other 80′s toys) I have ever seen. What a magnificent room! Owh, I am missing carded ones, you do not have those?